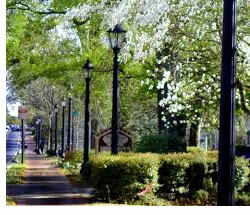 Roswell was founded in 1854 and is an affluent city in north Fulton County. Established due to the observation by Roswell King that Vickery Creek was a perfect spot for a cotton mill, Roswell is rich in history. Points of interest include Historic Roswell District, Holly Hill, Atlanta Rowing Club, Primrose Cottage, Faces of War Memorial, Chattahoochee River National Recreation Area, Barrington Hall, Bulloch Hall and Archibald Smith Plantation Home. Festivals and parades in Roswell occur throughout the year. Roswell remains one of the largest cities in the state. Tree removal in Roswell must abide by the rules set forth in the Tree Removal Permit Application. If the tree has a single trunk of more than three inches in diameter and naturally attains a height of at least fifteen feet, a tree removal permit will be required. Application approval by the Zoning Director is required as are the fees. You will also have to include site, tree protection and tree replacement plans as applicable by the specific permit you're filing for. All rules for tree removal in Roswell are set out in the Roswell Zoning Ordinance. # Just wanted to let you know that your crew did a great job on removing three limbs from my roof. This was the Sunday after the tornado in downtown Atlanta/Cabbagetown. The crew was very professional, took care in my home, roof, stacked usable wood for my fireplace, and cleaned up the roof and yard when the removal of the limbs was complete. Please pass along my thanks to Brian and his crew.